Ultrasonic linear transducer from 12"-108"
The M1450 series Shut-Height monitor uses linear ultrasonic rod as its position feedback device. Ultrasonic transducers are easier to mount on the shut-height mechanism, however the cost increases in proportion to maximum shut-height of the press. A 6 digit LED display indicates shutheight as well as 8 programmable PLS limits associated with the shut height. 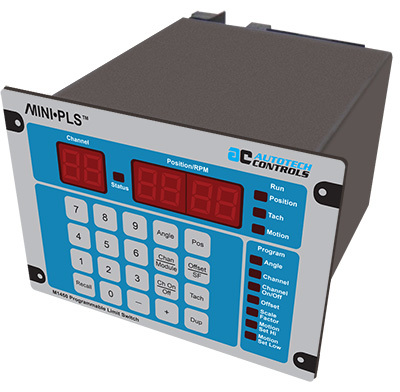 The M1450 programmable shut-height monitor consists of two parts, one being a linear transducer mounted on the shut-height mechanism and the other, a programmable unit mounted in the Press control panel. The position signal is scaled and displayed on the front panel, which indicates shut-height in appropriate engineering units. There are 8 programmable limits that monitor shut-height value than provide alarm outputs. The M1450 reads the linear travel with 0.001” resolution and up to 108” of travel. This unit utilizes an ultrasonic transducer to monitor the linear position of a shut-height mechanism by the movement of a 1.3” diameter magnet ring over a 3/8” diameter stainless steel rod. An ultrasonic wave travels along side the stainless steel tube and is reflected by the magnet. Time measurement of the ultrasonic wave determines the position of the magnet from the base of the transducer. linear rod being used. Calibration is extremely easy. All that is required is entering a number printed on the label of linear rod. The base measurement from the transducer can be converted to any engineering unit by a programmable scale factor. Shut-height drift is monitored against a programmed upper and lower limit and an appropriate output is generated if shut-height is outside the limit.